Summer, in principle, is when I have more time in my hands since I am not teaching, and I can go through life at a more leisurely pace. In principle! In practice, summer is even more hectic than the teaching semesters, as you can infer from the small number of posts in this blog. Since classes have ended, I had a trip to Baltimore to give a talk on planets rising from the grave of dying stars, another trip to Boston for the meeting of the American Astronomical Society, and soon I will have a new trip to Vienna to give a talk about how those same dying stars are on a fast slimming track. And in-between all this I worked on two papers, on observing proposals, visited some collaborators in Minneapolis, monitored my graduate students, one of which graduated last week. So much for a leisurely pace! All this should explain why this post about "my" foxes had to wait until now to be written. Well, this plus my reluctance on writing about something that was still a developing drama, with uncertain end. But let's start from the beginning. As you know we live at the edge of a small university town, just a short walk from a park that borders with undeveloped corn fields and a little forest. This park is frequented by numerous wildlife; not just the deers that Kero love to chase (if he could) but also predators like foxes and coyotes. They come out usually at sunset (presumably at early morning too, but that's not my game), and I often see them when I walk Kero at our unusual hours. Right at the entrance of the park there is a small creek collecting the neighborhood rainwater. The creek is usually left alone, and had been overgrown with bushes and tall grasses. I never paid much attention to it, except for checking on the muskrat that lives in the area, which is what I thought I saw, one evening in early April, as a shadow moving in the bushes. I pulled Kero close to me (muskrats elicits from him the same reaction that rabbits do), and started looking. 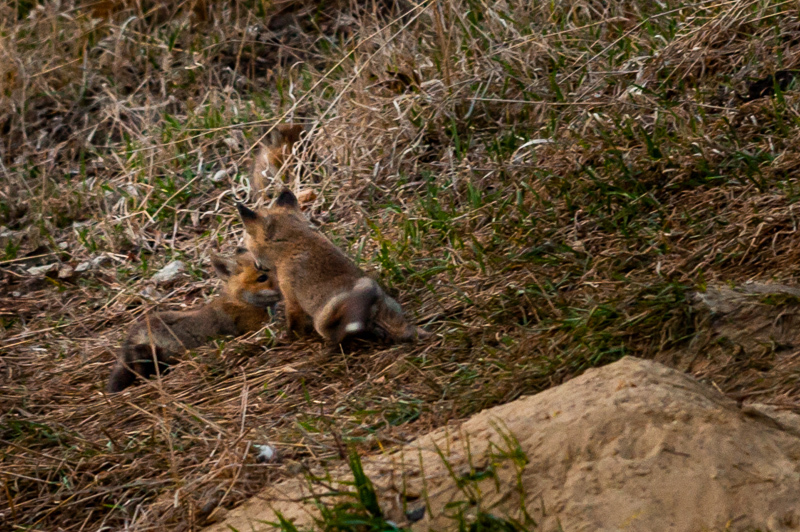 What I saw were two little fox kits, and their mama checking on me while I was looking at her pups! I hushed kero and walked him home, then went back there with my camera to check if they were still there. They were there! 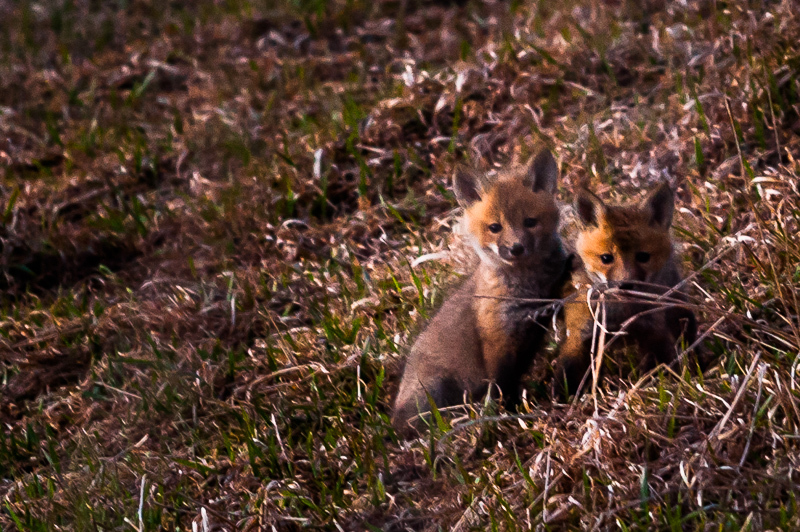 It was dark and I didn't want to get too close to avoid bothering them, so my photos are a little too fuzzy for my taste (if you want to see deliciously cute sharp fox photos, have a look at the work of Roeselien Raimond). Still these are my foxes, so I want to show them here. I went there a few times, and they seemed to be quite oblivious to the people passing by. Mama fox was always in the vicinity keeping an eye on them and on the people passing by, when they were out playing (always at dusk, I never saw them out during the day). I am not entirely sure how many kits there actually were: in one occasion I counted at least 5 of them out at the same time, but they could have been six. Overall it was quite a large litter, the cutest thing in the world, playing like crazy the same way dog pups do, coming in and out from the numerous holes of the rather large den that their mama dug on the side of the creek (you can have an idea of the den size in the panoramic photo at the bottom). The problems, however, started a week or so later. The neighborhood north of the creek is prone to flooding, mainly because the drainage holes in the streets do not have enough capacity to eliminate fast enough the strong summer rain that happens in this part of the country. To solve this problem the town started digging a new drainage system, and part of the work included enlarging the pond where all this water is supposed to end, and the creek that brings the rainwater into it. The creek, yes: exactly where the fox kits had their den. One day, with horror, I noticed an excavator parked on the side of the creek and red marks all around the slope indicating the area to be excavated, that included the whole den with its occupants. That is when I met another photographer that had been visiting the kits like me, and after some brainstorming she called the city department that deals with wildlife, managed to talk with a local biologist, and succeeded in having the city stop the digging for at least two more weeks, to give time for the kits to be strong enough to move on their own without harm. I visited the site in the following days, and they were still there, playing outside their untouched den, despite the loud noises all around the area that the heavy machinery must have been making during the day. After a week I had to leave for one of my trips, and when I came back the den seemed empty (still untouched). When they finally dug out the area for good, it seemed that there was nobody around. While I cannot be sure of what ultimately happened to the kits and their mama, I believe everything in the end went well. A few weeks later I saw a beautiful young fox with a lush fur along the path next to the creek, basking in the last rays of the sun. She looked at us, unconcerned as we approached, and then took off in the tall grass bordering the newly fashioned creek. 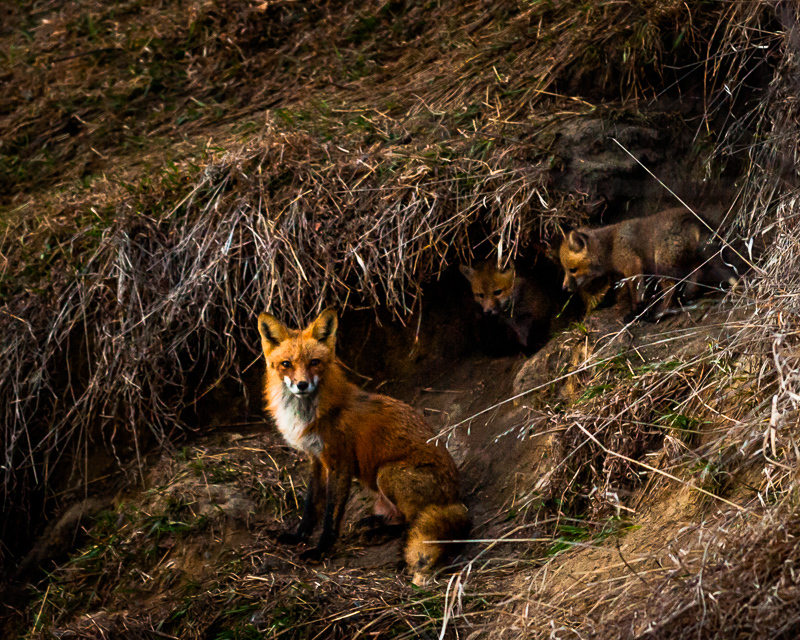 Maybe she was prospecting for a new den, to raise the next generation of kits in the years that will come?